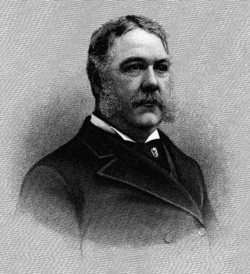 Chester Alan Arthur ( October 5, 1829 – November 18, 1886) was an American politician who served as the twenty-first President of the United States. 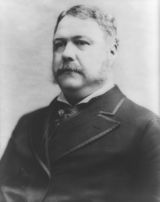 Arthur was a member of the Republican Party and worked as a lawyer before becoming the 20th vice president under James Garfield. 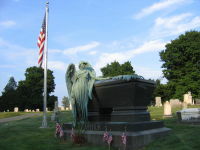 While Garfield was mortally wounded by Charles Guiteau on July 2, 1881, he did not die until September 19, at which time Arthur was sworn in as president, serving until March 4, 1885. This was an extremely lucrative and powerful position at the time, and several of Arthur's predecessors had run afoul of the law while serving as collector. Honorable in his personal life and his public career, Arthur nevertheless sided with the Stalwarts in the Republican Party, which firmly believed in the spoils system even as it was coming under vehement attack from reformers. He insisted upon honest administration of the Customs House but staffed it with more employees than it really needed, retaining some for their loyalty as party workers rather than for their skill as public servants. Knowing the election would be close, Garfield's people began asking a number of Stalwarts if they would accept the second spot. Levi P. Morton, on Conkling's advice, refused, but Arthur accepted, telling his furious leader, "This is a higher honour than I have ever dreamt of attaining. I shall accept!" Arthur worked hard raising money for his and Garfield's election, but it was still a close thing, with the Garfield-Arthur ticket receiving a nationwide plurality of less than ten thousand votes. The Vice President was in a major bind. He knew that there were a great number of people in the country who thought that he had something to do with the attempted murder of the President, and didn't want anything to do with succession until it was actually necessary, so for two months and 19 days, the country drifted, leaderless. On September 19, Garfield died and Arthur succeeded to the Presidency. Publisher Alexander K. McClure wrote, "No man ever entered the Presidency so profoundly and widely distrusted, and no one ever retired… more generally respected." Author Mark Twain, deeply cynical about politicians, conceded, "It would be hard indeed to better President Arthur's administration."